Such was the demand for tickets for Anthony's show at Ards Arts Centre last Friday that the gig was already sold out way back in February. So the organisers added a second date, on May 17. This allowed Anthony to add Ben Glover as the special guest for the night (Ben will also be Anthony's guest on the May 16 show at Antrim's Old Courthouse the night before). 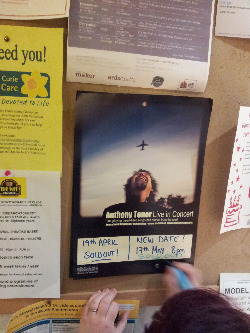 When Anthony arrived for the April 19 show at Ards, he was told that only 15 tickets were left for the May 17 show. After a storming show with THREE encores, a member of the Ards Arts staff told him as he packed his guitars that the remaining 15 tickets had gone that night. This is the second year in a row that Anthony has sold out TWO shows at Ards.